Today is my last week as Design Team member of the CAS Winter Challenge DT for SCS. The past three months have gone by so quickly and I'm sad to see my time on the team come to an end. It has been a wonderful experience and I hope that I have made cards that inspired others to join in the challenges. The next Design Team search is currently underway, with two of the three challenges completed. Tonight the Finalists will be revealed and the last challenge posted. The new Spring Design Team will be announced on March. 1st. It's going to be so exciting! All the entrants are so talented and have created fabulous cards for this competition. I know that the new CAS Spring Design Team will be amazing! On to my final Design Team cards ... I have made two for this week's Challenge (CAS159 - color challenge - white and razzleberry). I have a hard time just making one :) Both cards are basically the same layout. Hope you like! I inked the tea cups in Rich Razzleberry ink and stamped at the bottom of Whisper White cardstock. I mounted a wide strip of striped Rich Razzleberry DP at the top. I ran a thinner strip of Rich Razzleberry cardstock through my Big Shot with the scalloped edge die-cut and mounted it on top of the bottom of the striped DP. I wrapped the ribbon around the card front and tied a 1/2 knot off-center. I mounted the card front onto a card base of Rich Razzleberry using sticky strips. I made a "tea cup charm" by stamping the tea cup from Morning Cup stamp set in Basic Black ink onto silver cardstock. I cut the cup out and covered it with Crystal Effects and let it dry for about an hour. I punched a hole through the "handle" of the cup. I stamped the You're in Rich Razzleberry ink onto Whisper White cardstock. 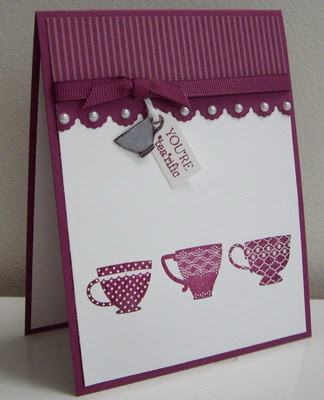 I used the Stamp-a-ma-jig for placement and stamped 'tea'rific in Rich Razzleberry underneath. I cut the cardstock into the shape of a small tag. I punched a hole at the top. I used a glue dot to adhere the silver cup on top of the tag (lining up the hole punches, but making sure not to cover up the sentiment). I threaded white Baker's twine through the top of the tag, trimmed the ends and adhered the ends under the knot. I placed a half-pearl on each scallop. The second card is all about the buttons. 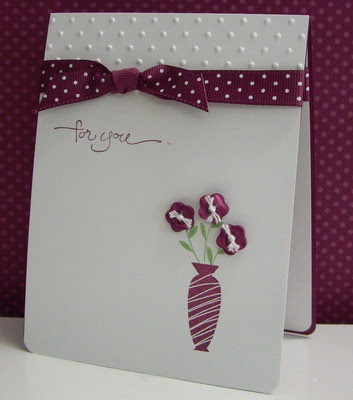 This card also qualifies for this week's Ways to Use It Challenge - Bring on the buttons!. Hope you like. I stamped the vase in Rich Razzleberry ink. I placed a post-it note to mask the top of the vase and then stamped the leaf sprig three times in Wild Wasabi ink; I removed the mask. I ran the card front through my Big Shot with the polka-dot embossing folder just at the top. I wrapped the ribbon around the top of the card and tied a 1/2 knot off-center and placed a glue dot under the knot to hold it in place. I rounded the bottom corners of the card front and card base of Rich Razzleberry cardstock. I mounted the card front onto the base for stability. Using the Stamp-a-ma-jig for placement, I stamped the sentiment in Rich Razzleberry ink. I threaded white Baker's twine through each of the three buttons, tying a knot and trimming the ends. I secured the buttons to the card front using glue dots. Labels: CAS, friendship, sizzix, Stampin' Up!